I applied for a SOAR scholarship based on the writings I've done on this blog, and Friday received a kindly rejection letter from Spin Off. Admittedly I was bummed, but by the afternoon it was time to get over and into something else. My heart's always reminding me of my ability to compartmentalize-- my foolproof method is to throw myself into something new, or at least really interesting. 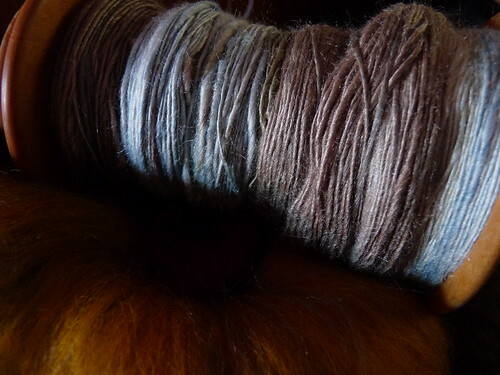 I grabbed my Matchless and 2 ounces of indigo dyed tussah silk from A Verb for Keeping Warm and went to town. I'm not a really big fan of 100% silk yarns, to me they mean lace or summer. I didn't want to card the silk into a wool like last time, so instead I laid out the length of silk (dyed in large color sections) and pulled off lengths in color order for spinning over the fold. I haven't spun over the fold since first teaching myself to spin, and I do like the control it gave me in handling the silk. 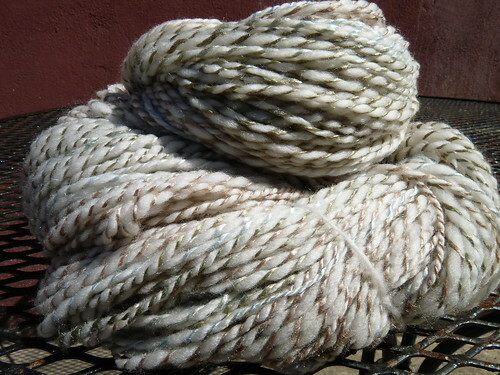 Originally I was going to spin another handpainted single of Verb's merino/silk for plying with the tussah, but went off the rez with a white merino/cashmere top instead. I think the white really shows off the long stretches of color Kristine dyed that I tried to keep intact. Another reason I chose the white was because it is superwash-- my baby sister just had her baby and I wanted to weave her a large nursing wrap/coverup that could be easily washed when my nephew invariably does a baby blowup near or on it. I changed my mind though (like usual)... the yarn is just way too soft for weaving; not that it wouldn't hold up to it but that the crazy softness just wouldn't translate to a woven fabric like a knitted one would. I kept trying to take pictures so I could choose the one that looked the softest :) I don't know if it worked but eh, I could look at the shine of the silk all day. oooooh, beautiful. i would lean towards something snuggly -- maybe a textured shawl, or a big cowl, depending on how spring is going out there....definitely something simple, so as to be able to focus on the pleasure of knitting with it! just lovely. 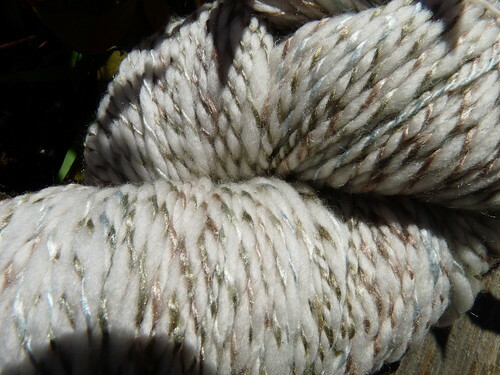 400 yards of light worsted ... I would make a baby kimono-type of sweater, if that would be enough. Something with cables to catch the shimmer of the silk. Whatever you make will be gorgeous - looking forward to seeing it! It is definitely one of the prettiest things I could replace my pet rock with! 400 yds for a baby... and snuggly... maybe a little hat and a matching stuffed bear? Already said, but I am also going with cowl. That yarn looks like it would be so warm and snuggly! My guess would be... A light shawl/shoulder covering/shrug, or maybe a stuffed toy of some sort? Gorgeous yarn! Those silk blends look so yummy! 400 yards sounds just about right for the One-Row Handspun scarf: fabulous, simple, and eternally entertaining. I knit two in December, both in 4 days. Plus that scarf really leaves room for softness and snuggling. again in a hearbeat. Super cute! Your yarn is totally crazy drool worthy. Do you plan on going to SOAR even though you didn't get the scholarship? I am thinking about going but I am not sure yet. I'm not sure, but it would make the cutest kid's sweater ever. Once again, I love your yarn! I can't help but imagine it as a cowl...maybe a longer moebius one that could be looped once or twice around the neck. I see it in a super simple lace pattern that wouldn't compete with the yarn. Of course, I'm sure whatever you make will be lovely! Too bad about SOAR, but there's always next year! Oh yes, the cowl is winning hands down. Something loose so I could pull it up over my face if it gets cold enough! That's too bad about SOAR - your blog is so edumacational! If I had that much gorgeous squooshy yarn, I'd probably knit something lacey - a smaller Hemlock Ring blanket? Something cozy. Sorry to hear about SOAR. But the yardage you spun up is a dream. I was thinking just like Jenn...a baby kimono or I can also picture an EZ's BSJ. Makes me think that I need to get some more white fiber to ply with all of the brights that I have in my fiber stash. That turned out gorgeous! I don't think I'd be as generous as you and I'd probably knit something for myself. 400 yards? I'm guessing a smallish clapotis! I'm sorry that you didn't get the SOAR scholarship. I've loved your posts and have learned so much about processing fleece - I'm begging my guild to buy combs! I went to SOAR last year and I'd say you definitely deserved a scholarship. Just looking at it makes me want to make something warm to go around my neck with beads. A looser version of a cowl, with beads scattered on it for good measure. 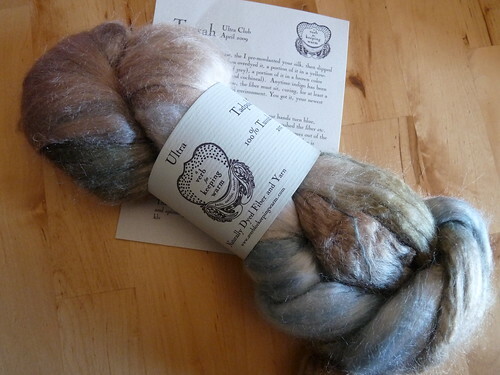 I love the finished yarn you made, and the shine the silk gives to it. I'm imagining that as the cutest snuggly sweater for a baby ever! That is a beautiful combination. I wish that I had an eye for combinations like you do. I would knit something snuggly and smooshy to keep myself warm in the winter but also to hug against my bare skin when I felt icky. And perhaps if my brain were not slightly fever-addled I would have a more normal answer but TOO BAD. I would make a thorpe, personally! I think you can just knit a wrap out of that.. or a baby sling. I'm in love with garter stitch at the moment, so maybe a BSJ for a baby. Wow! That yarn alone is reason enough for you to receive a scholarship to SOAR. Makes me want to cancel my Spin-off subscription in protest. I love your blog and I am always inspired by your wonderful spinning and knitting and amazed that you can do all that as well as capture it so beautifully in a blog. As for what I would make, long white evening gloves if I lived in a fantasy world and knew how to do fingers and, back to reality, a lace scarf or fingerless mitts. Thanks again. I hope you get to SOAR. You deserve it!!!! Sorry to hear about the Soar scholarship...I didn't get it either. I just found your blog...well was sent over by a friend and it's awesome!! Can't wait to go back and read the old posts. :) The silk is beautiful!! My goodness, that's fabulous. I would knit something with a fairly dense gauge because I love how silk and silk blends feel that way. Perhaps a simple shawlette with alternating lace and stockinette panels, so that the silk is shown off in multiple ways. Nummy. I'm going to guess Ishbel. It's the right yardage and would have enough stockinette to showcase the gorgeous yarn! Bummer about the SOAR scholarship but YAY for the beautiful white, silky goodness. I'm guessing cowl too but since everyone else has already chosen that, how about a headband, maybe like Calorimetry? I'm still trying to decide what to do with my AVFKW shipment. I've only gone as far as taken it out of the package, squeezed it a few time with a slight squeel, and set it on my desk to admire. That's such a good idea of spinning over the fold though. I was just thinking how difficult it was to handle silk. Over the fold might actually give me enough control where I'm not having to fight the wheel. Thanks for that! You were robbed!!!! I'm sorry you didn't get in my Dear. I hope your spinning/knitting/weaving can pull you outta that funk! Rest assured you have many fans who hang on your ever word! Here's to next year. I'm sorry you didn't get the scholarship for SOAR. I would have loved to read your report after the event. Hopefully, you'll get it next year. Your yarn is seriously gorgeous! And yes, it definitely looks like it is very soft. The softness makes me think I'd knit it into a scarf or a cowl... something to snuggle in! I'm very curious to see what you are doing with it. Gosh, it's hard to guess! I've never spun anything, ever. It will be something I shall do someday! Your lush yarn would make a pretty top down baby sweater, bootie and cap set. But, then again, you could always make a lux scarf and give it to me!! I'm guessing you're making something for the baby. I'm sure whatever it is, it will be beautiful and lovely to wear or use! I just love all your spinning and knitting and weaving! Gorgeous. I love A Verb for Keeping Warm!!! I think it would be beautiful as a garter stitch baby sweater! The yarn seems like it would be nice knitted as something like a clapotis which has both knitted sections and open sections. I bet with 400yds you can make a nice sized piece of fabric. I often use my clapotis as a lap blanket when I'm sitting at my desk so it plays double duty as both a scarf/shawl and blanket. I put in for a scholarship last year and got the polite "you didn't make the cut, try again next year" letter too. Maybe I'll try again when SOAR comes back this (MI) way. And I'm on the soft squishy cowl team. I've got 8 ozs of gorgeous merino/bamboo and a single oz of silk in similar colors...trying to decide whether there's any chance of streeeeeetching the silk enough to combine the two. Spin the silk itty bitty lace weight and the merino blend maybe worstedish and two ply them. Hmmmm. I would make either a little slouchy beret or a nice comfy cowl. That looks like the PERFECT thing to have up nice close to your skin during a freezing winter. 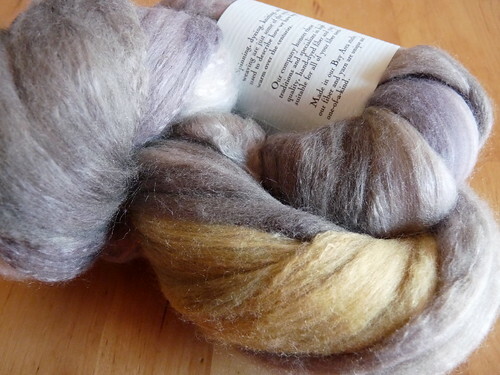 combining 3 things i love: AFKW, silk, and spinning. yes! i'd spin it really thin, maybe 3 ply it for better stitch definition. heavy lacewgt. definitely would love to see it around my neck (as a knitted garment, of course!). the colors are beautiful! Best baby hat ever? With ear flaps? Like a baby Jayne hat. Oh, PS, first spindle still lost but went back and replaced it with a Golding. Go big or go home right? I would weave a pillow sham that was exclusively mine (shear decadence), or knit a snuggly stockinette cowl (though you don't really live in a cold enough climate; so what about a thorpe hat for those few days when it does get cold. It would be nice and soft on your toasty warm ears. 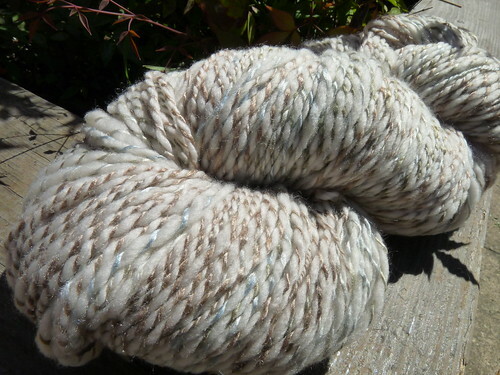 I don't know what I'd do with it, but I really want the roving. Thanks, Aija.